The Snooze Button Generation 2019: Is it possible to rock wearing shorts? The greatest thing about AC/DC is the shorts. The worst thing about AC/DC is the shorts. As the Snooze Button Generation continues to celebrate Rocktober by focusing on rock 'n' roll, an extremely important, age-long question must be pondered: Why are shorts so uncool on rock stars? A reasonable human being might say that no, no, shorts don't automatically make a rock star lame. Just look at Angus Young of AC/DC. Nah, I don't think the shorts work. Angus comes off as creepy and a joke. If that's what he's going for, that's great. However, this shorts issue is quite complex, and Angus can't be dismissed. Quite frankly, he almost pulled off the shorts thing. 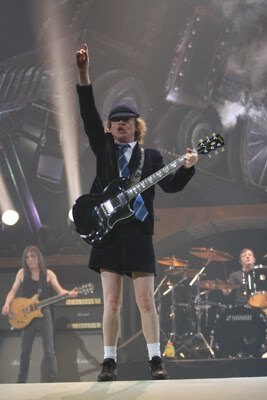 For that, he deserves props, and it is obvious that the best thing about AC/DC is the shorts. Is it ever right for a male to choose shorts as a style choice when temperature is not a factor? Answer: No. I have no images in my mind's eye of Frank Sinatra in shorts. I cannot think of any stylish gentleman in shorts. Anderson Cooper? Johnny Depp? Elvis? 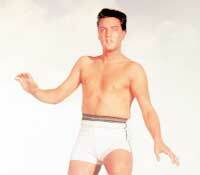 Well, shorts don't exactly come to mind with Elvis, but his "Blue Hawaii" vehicle made temperature a factor. He was in Hawaii, for god's sake. Every so often, an extremely douche-bag-esque rock star pops up who attempts to wear shorts. It simply won't work. I remember seeing a video by Faith No More in which the lead singer wore shorts. Ridiculous!